עולים לברלין Olim le Berlin? Olim le little Beirut? – Wem gehört Moabit? This time it´s not about the German pudding, but about real estate in the most rapidly developing and promising city in Europe in Berlin/Germany. With this words Adi Keizman and his companies Berlin Estate and Berlin Aspire pitches condominiums in Berlin especially to Israelis. But is the investment really as good, as Adi Keizman wants to make us believe? For example Huttenstraße 71, which he proudly presents as the latest project? From German point of view the Huttenstraße definitely hasn´t been a good area over the past 80 years and already in the first German Monopoly the Huttenstraße ironically has been the cheapest street! (Please click to enlarge the picture! )And still today it`s a social difficult and very poor area, with a lot of shabby buildings, where criminal Lebanese family-clans like to perform and the Berliner just call it little Beirut. Real estate investments with promising profits and returns should always be carefully analyzed, especially if there can be detected some of the 5 typical alarm-signals for scrap real estate in the business model, as the German Wikipedia explains. Also Junk properties, or scrap real estate deals and fraud (in German „Schrottimmobilien„) have become so familiar in Berlin, that even the Berlin government on his website alerts. 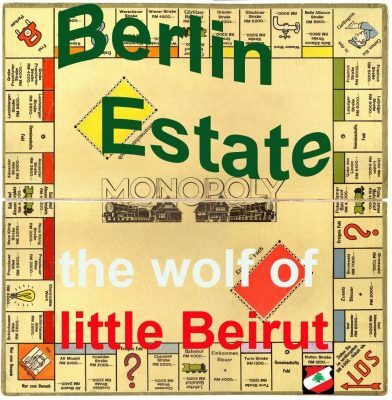 Jetzt berichtet auch die renommierte Berliner Kanzlei für Anlegerschutz und Kapitalmarktrecht Schirp & Partner Rechtsanwälte mbB über das Berlin Estate Monopoly! Anscheinend geht es um Schadensersatzansprüche aus dem Vorkaufsrecht, die Berliner Mieter nach Umwandlung in Wohnungseigentum womöglich haben könnten, auch wenn sie das Vorkaufsrecht nicht ausgeübt haben! Konkret werden die Unternehmens Berlin Aspire, Berlin Estate und die Hausverwaltung Bearm genannt, sowie eine Liste mit 44 Berliner Häusern und 44 Gesellschaften! Was ist da los! Das sollte alle Mieter der betroffenen Häuser interessieren! Again in english – lawfirm Resch about Berlin Estate – Berlin Aspire. They ask: are the investors informed about the risks of the precontract? Aber warum schreibt die Zeitung hier immer nur von Berlin Aspire? Das ist der Name, unter dem die Firma in Deutschland agiert. Aber in Israel kennt man sie nur unter Berlin Estate! Die Infos sind doch nicht nur für Mieter*innen, sondern auch für Anleger*innen wichtig!